An outstanding business and community leader, Peter Dhillon is also involved in a wide variety of critically important areas including health care and research, land management, sport and education. In addition to the great benefits that his family cranberry growing business, The Richberry Group of Companies, has given to the economy of B.C., he has put equal importance on his philanthropic and charitable service. Mr. Dhillon has played an active role on many organizations and boards, including Director of Vancouver Airport Authority, Board of Governors of Simon Fraser University, Director and former vice chair of Ocean Spray Cranberries, audit committee of the Vancouver 2010 Organizing Committee, Canadian Olympic Committee, Board member Vancouver Hospital and UBC Hospital Foundation, Director and vice chairman of B.C. Ferries, Director of Canada Customs and Revenue Agency and Director of Atomic Energy of Canada Ltd. 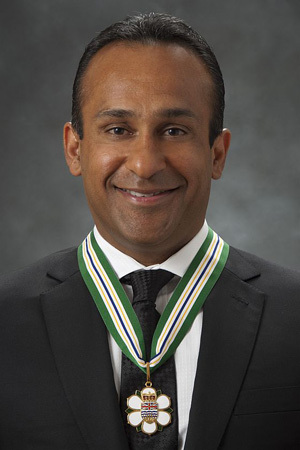 He has made significant financial contributions to many organizations including: Kwantlen Polytechnic University, the Canadian Red Cross, the Canadian Olympic Committee, Arts Umbrella, and the Khalsa Diwan Society. At the University of British Columbia he established the Rashpal Dhillon Pulmonary Fibrosis Research Endowment and the Rashpal Dhillon Track & Field Centre in his father’s memory. He is chair of the Vancouver Branch of the Right to Play, an international humanitarian organization for children in communities affected by war, poverty and disease.